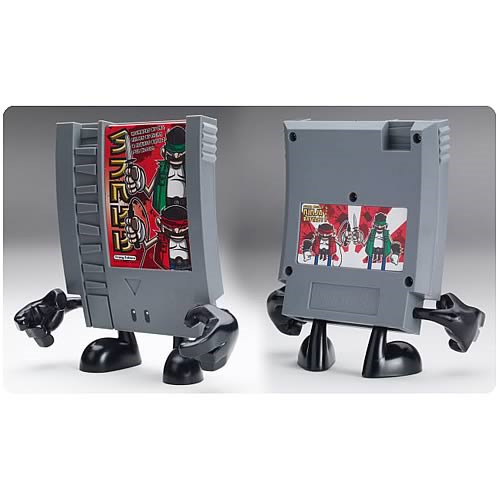 Awesome classic video game cartridge vinyl figure! The 10-Doh! So Analog Series is a line that collectors won't want to miss out on. Limited edition of 300 pieces! The 10-Doh! line of vinyl figures from Squid Kids Ink is one series that fans of classic cartridge video game systems do not want to miss out on! Resembling a classic video game cartridge from the home entertainment system Nintendo NES, this 10-Doh! Super Double Ninja Battle Bros. Video Game Cartridge Vinyl Figure by artist Tracy Tubera features two sets of famous brothers together and looks like it would be one awesome video game to play, kind of like a mix between Nintendo's Super Mario Bros. and Double Dragon, but not really. Measures 7-inches tall and is a limited edition of 300 pieces. Ages 15 and older.